Be ready for earthquakes & tsunamis with Earthquake by American Red Cross. 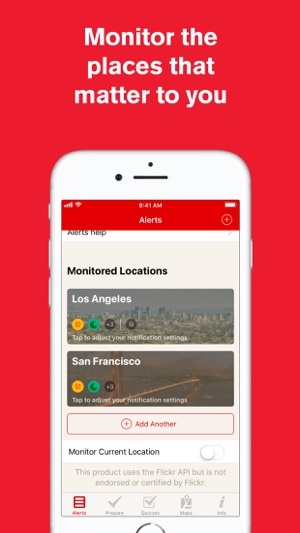 Get notifications and alerts when earthquakes or a tsunami occurs, prepare your family and home, find help and let others know you are safe even if the power is out – a must have for anyone who lives in an earthquake-prone area or has loved ones who do. 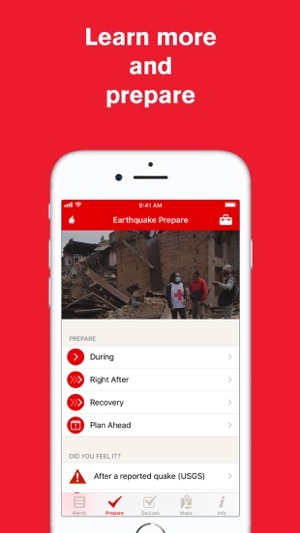 •Step-by-step instructions let you know what to do even before/during/after earthquakes or tsunamis, even if no data or internet connectivity. 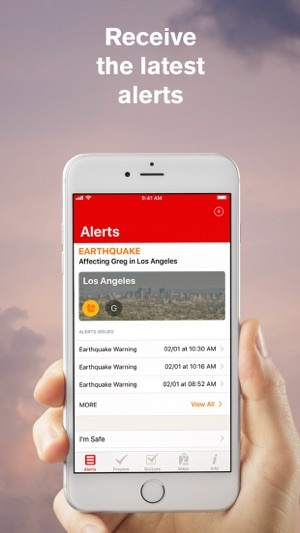 •Get notifications and alerts when a quake occurs and tsunami warnings in your area or those of loved-ones with push alerts from the USGS, including magnitude & Shake Zone maps when available telling you if it was just a tremor or greater. •Let friends know you are okay after a quake or tsunami with the customizable “I’m Safe” alert for Facebook, Twitter, email and text. 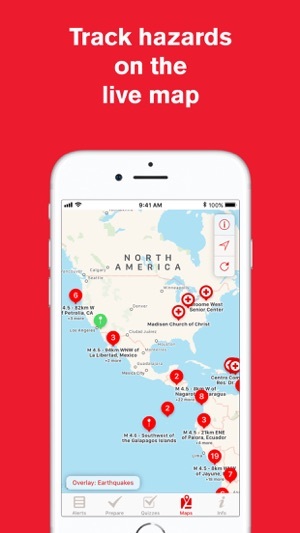 •Find open Red Cross shelters in your area when you need help. •Stay safe when the lights are out with the Toolkit, including a strobe light, flashlight and audible alert functions. •Prepare for the worst by learning how to assemble an emergency kit for your family in the event of power outage or evacuation. •Empower your family to stay safe and remain calm in an emergency by learning how to make and practice an emergency plan. •Earn badges that you can share via Facebook and Twitter with your friends and show off your earthquake knowledge with interactive quizzes. •Know what to do about food and drinking water when your area has been impacted by floods and power outages. The app was marginal in prior versions. My iPad 2 cannot handle iOS 10, so I had to delete the app from the iPad. The new version shows a lot of earthquakes but would benefit from the ability to filter by date range in order to see only the most recent quakes or only quakes from last week, for example. In the past, I had trouble with alerts and locations. Since I know nothing about the Flickr app that Earthquake uses, I chose not to set any locations or alerts at this time. I wanted an app that would tell me if that was an earthquake I just felt, but updates are delayed too much and it's faster for me to check the USGS site. Also, I have a fairly large region because I want to know if there's a if enough one originating 40 miles away that I might feel...but it keeps telling me about little ones. Tell me about just the big ones far away, but smaller ones close by. I want to know what I might actually have felt! Prior to the update I could tap on alert that was two days old and it would bring up the information. Now I tap on alert of an hour ago and it does not show me the location or the information it’s very frustrating. We need to have a little more history being saved on our locations.